As the days get shorter I am so happy to switch to a warm breakfast again and even since I did not grow up eating porridge (or Haferbrei as the German equivalent is called) I am a total porridge-freak. I prefer a very simple, near ascetic version of oats cooked in water and some salt and not too smooth mind you, I’ve got all my teeth – but then I top it with blueberries and a little golden syrup. Bliss. 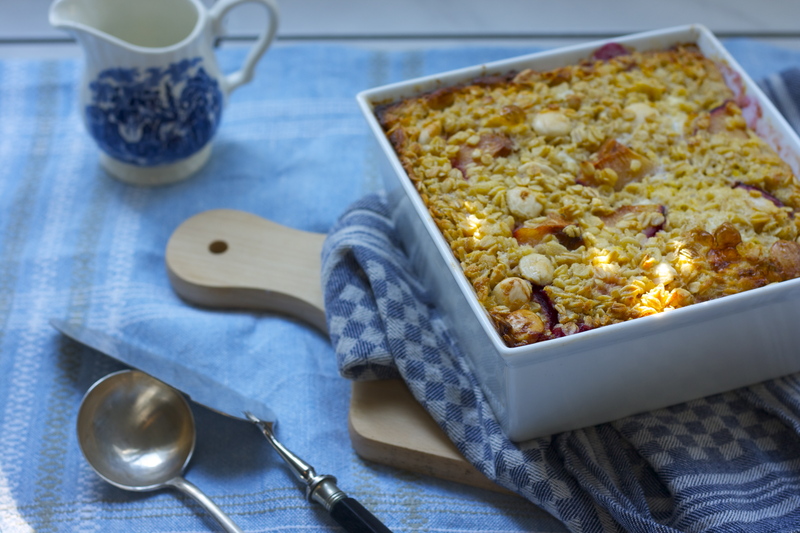 Of course, on the weekend a more glamorous breakfast is called for: bring on the baked porridge / oatmeal, a concept totally new to me but I am a convert if you need a healthy and yummy breakfast dish for a few weekend guests or a stress-less brunch. I did not even plan to make an apple cake this weekend – weird, right? 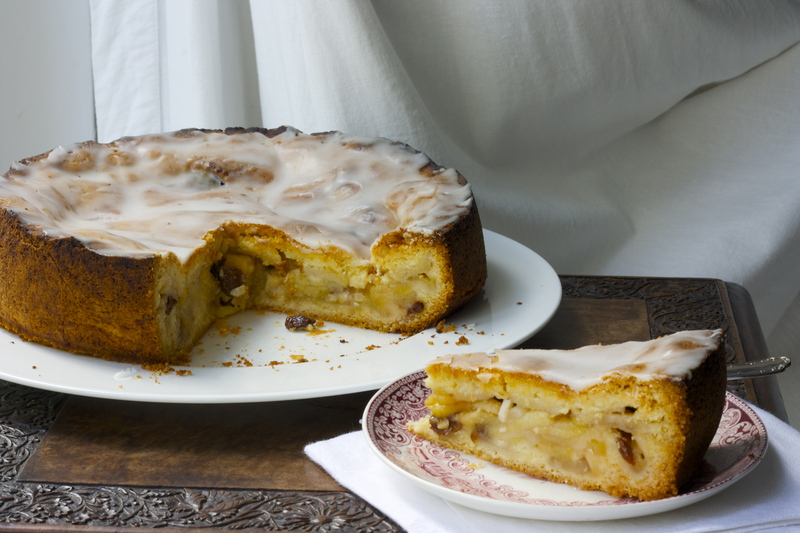 After all, autumn is apple time and therefore apple cake time. Well, luckily these apples found me. My go-to vegetable & fruit lady at the local market told me about these heirloom apples, an old cooking apple variety which is best for cakes and suddenly I was totally set on apple cake. I got a few Golden Nobles (Gelber Edelapfel), a variety that was found around 1800 in Norfolk and has been cultivated since 1820. It is an excellent cooking apple, very low in sugar and, according to Dr Wikipedia, suitable for diabetics. Above all it is beautiful in its yellow-pale green colour. Peel it as thinly as you can and discover why it is also called Wachsapfel (wax apple) since the skin comes off like a fine shaving of a candle and the pale yellow-green skin colour stays on the apple flesh. Anyway, this noble apple demands a special cake, a traditional German gedeckte Apfeltorte which is covered apple torte where a magnificently juicy soft apple layer studded with raisins and almonds is encased in a soft (yes) shortcrust pastry and covered with a lemon-sugar glaze. It does not get any more German than this. Sourcing recipes, I found one in a cookbook from 1894 (I love old cookbooks) for a Hamburg apple torte that sounded like the one I was searching for and was about to start when my Mum rang – excellent timing. Naturally, I told her about the market, the apples and that I was about to embark on baking (we talk about food a lot) and she told me about this old family recipe that she had been given by my grandmother’s twin sister and swore that Tante Martha’s apple torte is the best apple cake ever. As I said, excellent timing. Danke, Mama! 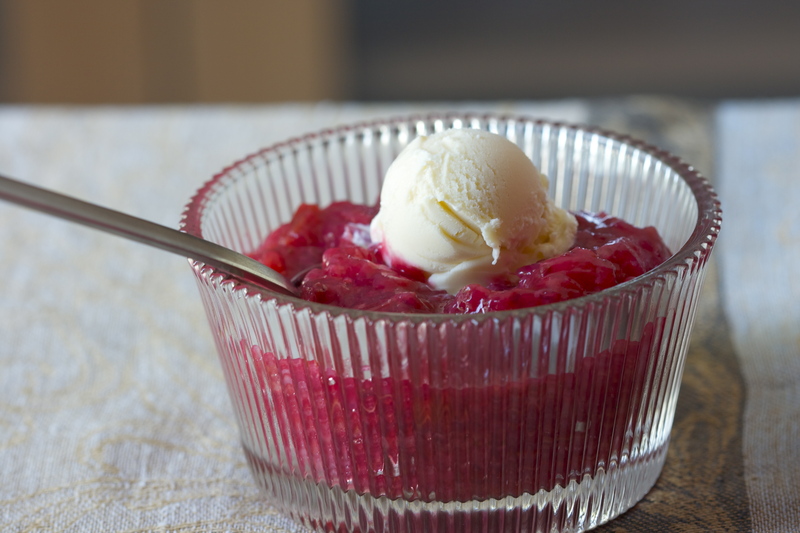 In early July when the red currants are ripe my grandmother always made Rote Grütze. We picked the shiny, glassy currants and other berries from the garden and she cooked her own version of this Northern European dish. I am still in awe of every bunch of sparkling red currant jewels and they should really be worn as edible earrings like you do with a pretty pair of cherries. Spring is not really spring without asparagus, strawberries, may bugs, sweet woodruff, peas, broad beans – ok, the list is endless. 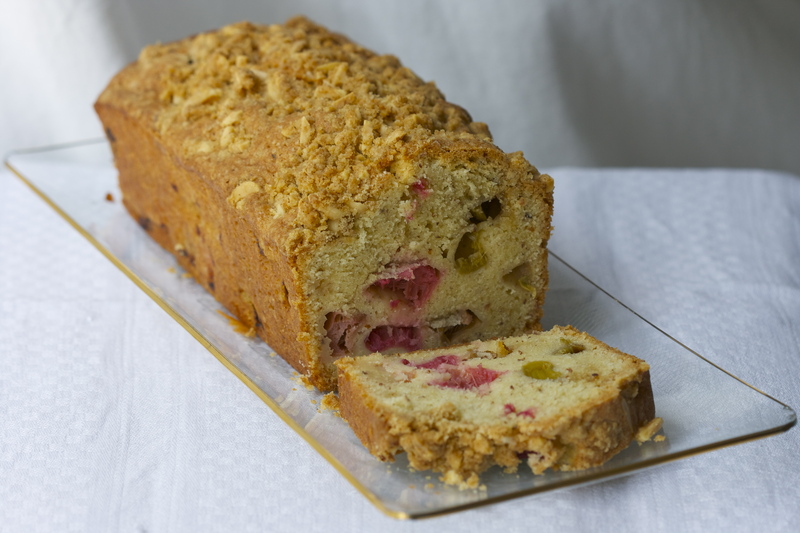 But what would spring be like without rhubarb and rhubarb cake? 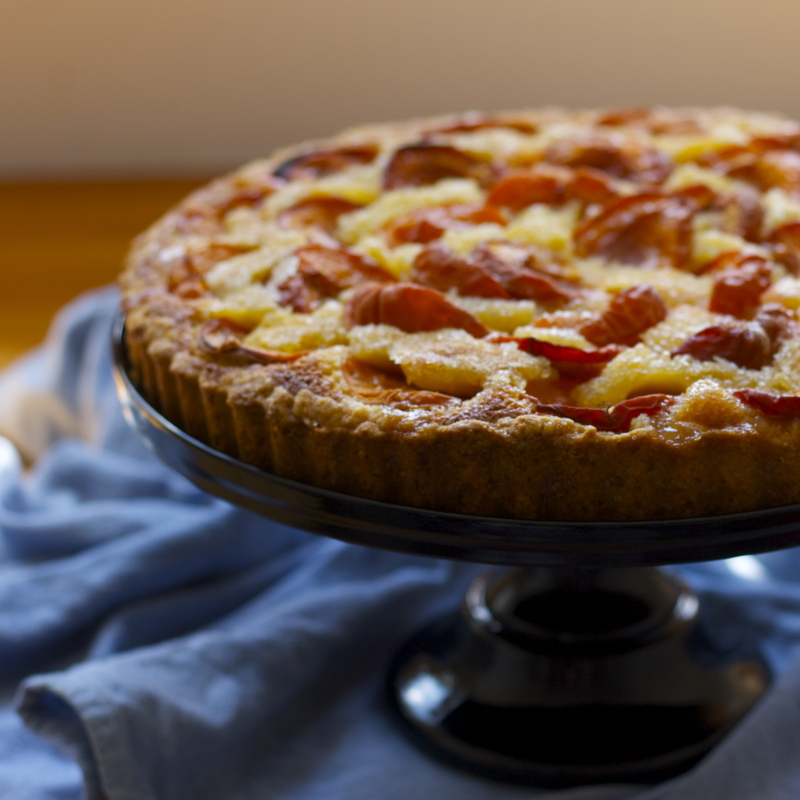 In my book a proper rhubarb cake is absolutely essential when the crisp air turns balmy and fragrant with all the sweet, fresh vernal scents while daylight returns. Just what I need when I have been working hard moving flower pots and planters about, scrubbing the terrace without ANY help – human or machine (I am not bitter, though) – and after the immediate danger of frost has waned, planting herbs and other delicate plants outside. P.S. Recipe in English und Deutsch. 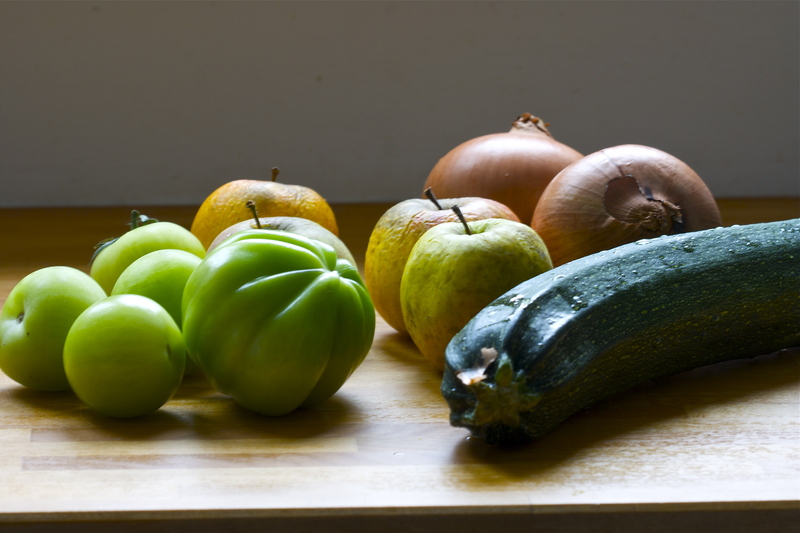 A recent visit to my Mum saw me return laden with a veritable bounty from her garden: several large zucchini / courgettes with aspirations to be full-grown marrows, apples, butternut squashes, lavender offshoots, super ripe tomatoes which hardly survived the journey and one giant white cabbage, where half of it still lingers in the fridge. I had bought green tomatoes to make us fried green tomatoes again and delayed, so they needed to be used too. The situation could have not been more auspicious for chutney.